This is the best tasting Alfredo sauce I've ever made. It was creamy and lick-the-bowl delicious. I did show some restraint and didn't actually lick my bowl. It was hard though! This was so simple and tasted amazing. 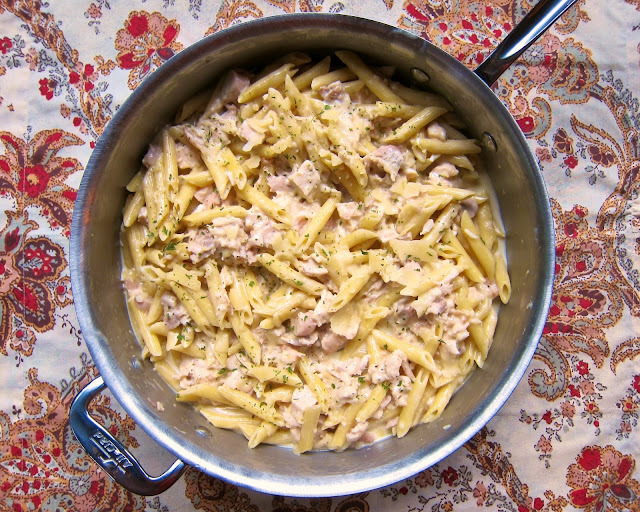 It is almost as easy as opening a jar of Alfredo sauce, but it tastes a million times better. We had enough for leftovers. It tasted just as good reheated the next day for lunch. Cut chicken into bite sized pieces. Pour olive oil into large skillet and add chicken. Cook chicken until browned, about 6 minutes. Add garlic. Cook 30 seconds, until fragrant. Add pasta, chicken broth and heavy cream. Cover and simmer for 15-20 minutes, until pasta is tender. Stir in parmesan cheese (I used fresh grated, but the green can will work too), salt and pepper. I love it and it is super good with blackened chicken too! Sounds yummy and super easy. Going to try this one next week. 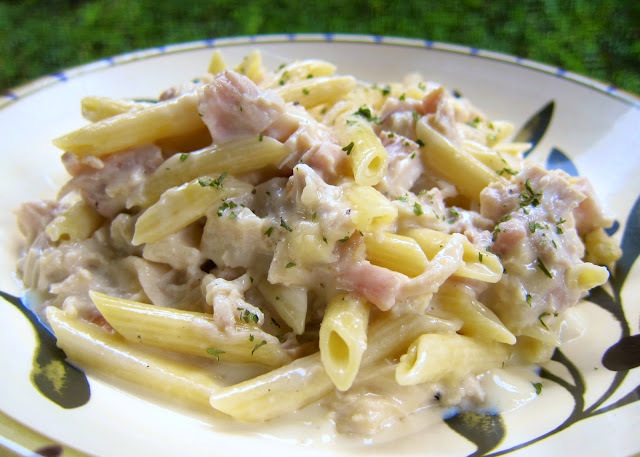 Made a version of this with 1/2+1/2 instead of cream and low fat Parmesan cheese (only 1 cup). It turned out AWESOME! Tasty, great and EASY recipe. Thanks. As my chicken was thawing, I realized it wasn't good--oops. So I made it as a side dish without chicken, and it was so good! I will definitely try again, both with and without chicken, and maybe also adding in broccoli. Dorothy - broccoli would be a great addition! SO glad you liked it! I made this for dinner last night and OMG it was delish! My family absolutely loved it! LaRay - so glad it was a hit! Katie - I love the addition of broccoli - so glad it was a success! 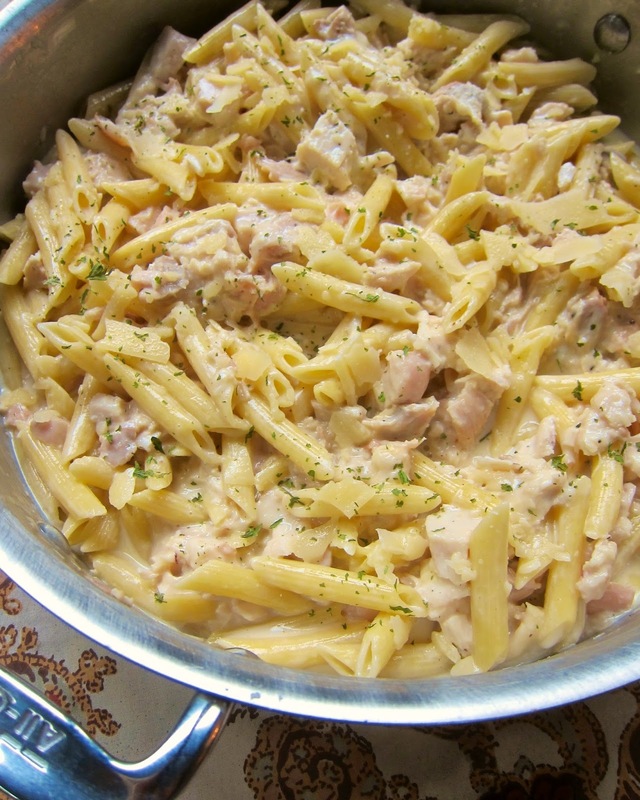 Might do this one tonight after football practice using the smoked chicken in the freezer. Made this tonight - loved it and so did my hubby! Hi! This sounds delicious! Do you think it would work as a crock pot recipe? I wonder if more liquid would be needed. Kasey - not sure how it would work in the crock pot . It only takes 20 minutes on the stove, so I'm not sure how long to cook it in the crock pot. If you try it, let me know how it turns out! I made this last night and it was so good! I added broccoli and cauliflower to it but followed the rest of the recipe to the letter! AWESOME will be making this again! when you call for parm, will the green can kind work or does this need to be freshly grated? Either is fine. I have used both and they work fine. The carton will say heavy whipping cream. It will be near the milk. OMG that was the best. My son and I have a code for food we really love. Don't eat it it's horrible, never make it again. This was one of those dished. Thank you so much for a great easy meal. When you say simmer, can you clarify the temperature/level? I just ended up with a burned mess...all of the liquid evaporated out. Luckily I was able to salvage the chicken. Looks delicious. Will try this new way of cooking No Boil Chicken Alfredo soon. Thanks for sharing. God bless.